Cauliflower is a garden vegetable belonging to the Brassicaceae family, commonly referred to as the mustard family. Cauliflower is also a “cole crop,” meaning it is a cultivated variety of the species Brassica oleracea. Other commonly grown cole crops include broccoli, Brussels sprouts, cabbage, collards, kale and kohlrabi. Parts of a cauliflower curd. Photo and graphic by Erika Lyon, Ohio State University Extension. The name “cauliflower” comes from the Latin caulis and floris, which translates to “cabbage flower.” Nutritious and colorful (purple, orange, yellow-green and white varieties exist), cauliflower can found in vegetable and ornamental gardens. Cauliflower is a cool weather vegetable, growing best with average temperatures between 60 and 65 degrees F and no higher than 75 degrees F. Cauliflower is more sensitive to heat than other cole crops. Prolonged periods of high temperatures or drought can cause developing curds, the edible portion of the cauliflower, to be stunted (called buttoning) or to bolt, which is when the plant flowers prematurely. 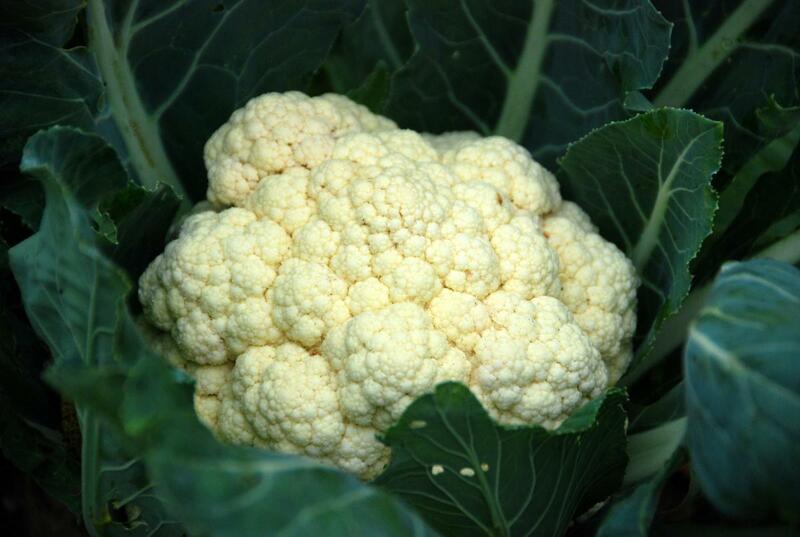 Cauliflower grows well in fertile, well-drained, moist soils with plenty of organic matter. Mulching around plants will help keep the ground cool and moist. Cauliflower has a shallow root system, so tilling near plants may cause harm. Provide consistent and adequate water when needed; 1 to 1.5 inches per week is adequate if an equal amount of rainfall does not occur. Soil pH should be maintained between 6.0 and 6.8 for optimum growth. A pH within this range will maximize nutrient availability and discourage clubroot, a disease that occurs most often when cauliflower is grown in more acidic soils, with a pH lower than 6.0. Mature cauliflower curd. Photo from pixabay.com. Direct seeding of cauliflower is difficult, so seeds should be sown indoors 4 to 6 weeks prior to the desired transplant date. Optimal germination temperatures are around 75 degrees F. After emergence, maintain the plants in temperatures around 60 degrees F and transplant to the garden when plants have four true leaves. Transplants of healthy, established plants will encourage proper growth and development. Like other cole crops, cauliflower is frost tolerant in the spring, but mature curds are not resistant to hard freezes, when temperatures dip below 32 degrees F for several hours. While both spring and fall cauliflower crops can be grown, cauliflower is more sensitive to hot weather than other cole crops. For a fall crop, set out transplants in early to mid-July. When planting cauliflower, space plants 24 inches apart in the row with 30 inches between rows. When transplanting, use a liquid starter fertilizer to encourage establishment. Apply 1 cup of starter solution to each plant, preparing the fertilizer according to label directions. A sidedress nitrogen application of about 0.75 pounds of urea (46-0-0) per 100 feet of row when plants are well-established (2 to 3 weeks after transplanting) is desirable to produce a high-quality curd. Most gardens do not require the addition of micronutrients such as boron, manganese or zinc unless deficiency symptoms are observed. Principle disease problems are blackleg, black rot, clubroot and yellows. Many disease problems can be minimized by practicing crop rotation throughout the garden. Avoid planting any brassica (cabbage, broccoli, kale, kohlrabi, Brussels sprouts, mustards, turnips, radishes, etc.) in the same area within four years. When irrigating, avoid over wetting foliage and water early in the day to promote leaf drying. Plant disease-free seeds or transplants. Principle insect pests include the cabbage looper and imported cabbage worm, cabbage root maggot, aphids, slugs, and flea beetles. Caution should be exercised when applying insecticides to protect beneficial insects that may be in the area. Contact your local OSU Extension office for identification and control recommendations for diseases and insects on cauliflower. Always read and follow all label precautions and directions. 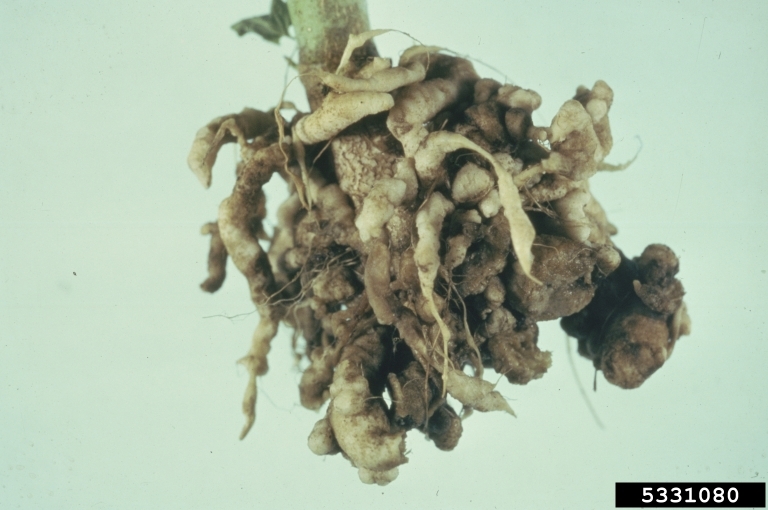 Clubroot causes roots to thicken and distort. Photo by Robert Wick, University of Massachusetts, Bugwood.org. 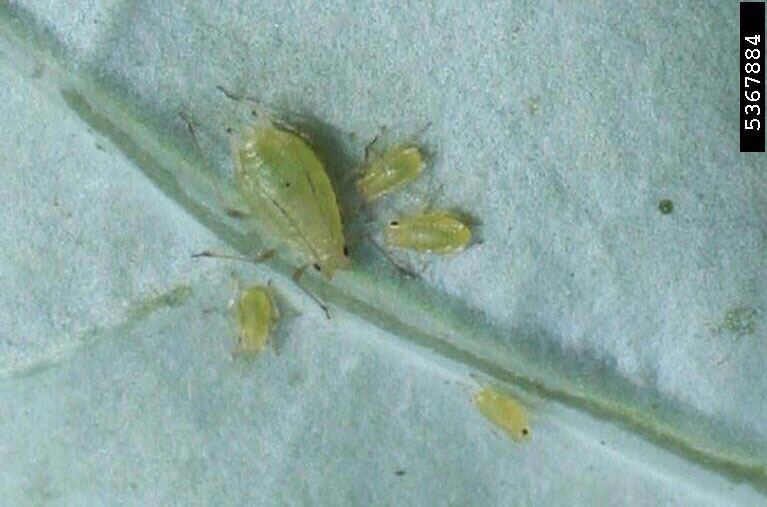 Aphids on a cauliflower leaf. Photo by Russ Ottens, University of Georgia, Bugwood.org. Cauliflower curds need to be blanched as they mature. This protects them from sun exposure resulting in a white, tender head. As cauliflower plants begin to mature and the curd starts to form, gather together and tie the leaves over the curd with soft twine, tape, or rubber bands. Blanching should be done when the curd is dry to prevent disease development. There are some “self-blanching” types of cauliflower available where the leaves curl naturally over the curd when grown in cool weather; however, some tying of the leaves may still be necessary, even in varieties of different colors. Harvested cauliflower curd with wrapper leaves. Photo from pixabay.com. 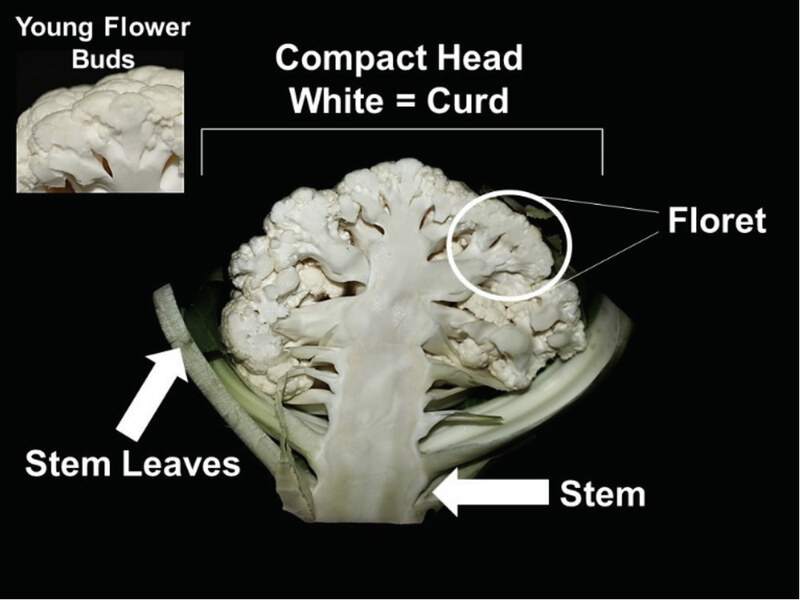 The cauliflower curd, like the broccoli head, is actually a group of tightly clustered flower buds. Harvest the curd when it reaches the desired size (approximately 6 inches in diameter) but before the buds begin to separate. This will be about two months after transplanting. When cutting the curd, leave at least two wrapper leaves with the curd. 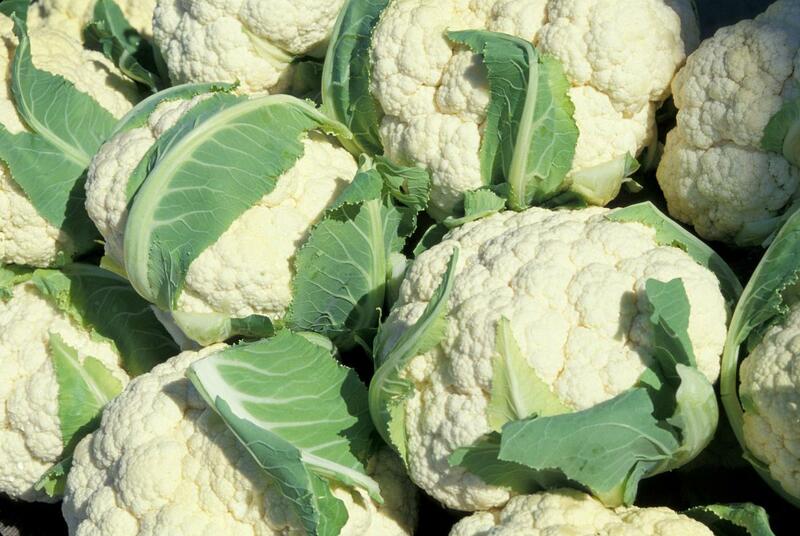 Cauliflower can be stored in a refrigerator for up to two weeks. High humidity of at least 95 percent is necessary to prevent wilting. Original author: James D. Utzinger, The Ohio State University. Second author: Marianne Riofrio, Ohio State University Extension. (Revised in 1992). Cornell University. 2016. Cornell University Vegetable Growing Guides. http://www.gardening.cornell.edu/homegardening/scene595b.html (Accessed on 06-23-2017). Texas A&M AgriLife Extension. Cabbage Flowers for Food. http://aggie-horticulture.tamu.edu/archives/parsons/publications/vegetabletravelers/broccoli.html (Accessed on 06-23-2017). Clemson Cooperative Extension. Cauliflower. http://www.clemson.edu/extension/hgic/plants/vegetables/crops/hgic1326.html (Accessed on 07-05-2017). Cornell University. 2017. Vegetable Varieties for Gardeners. http://gardening.cals.cornell.edu/citizen-science/ (Accessed 06-23-2017).